I have already posted on Vicente Romero in this blog. I am returning to this artist because I had the pleasure of meeting him in Saint Aulaye in the Dordogne last summer. Our meeting turned into an interview, which evolved into an article in the Pastel Journal, and this has just appeared in the August 2012 issue. 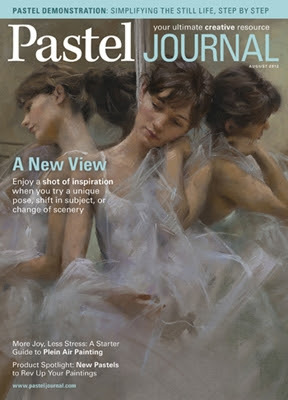 Overall it's an excellent issue, including not only Vicente Romero, but also Ken Gofton on Michael Norman, Aaron Schuerr on Sheila Rieman, and a demonstration by Sarah Blumenschein on her approach to still life. Unmissable. Incontournable. Bio: Janis is a native Californian who found herself living in New Mexico in the mid 1990's. She was drawn to the dramatic landscape of New Mexico and began taking pastel classes from Deborah Christiansen Secor and Albert Handell. She studied Bob Rohm, Clark Mitchell, Gill Dellinger and more recently with Richard McKinley. Her love of nature and the outdoors was a natural companion to her passion for painting plein air and continual quest to share her view through her paintings. In 2006, Janis moved to Grants Pass, Oregon. 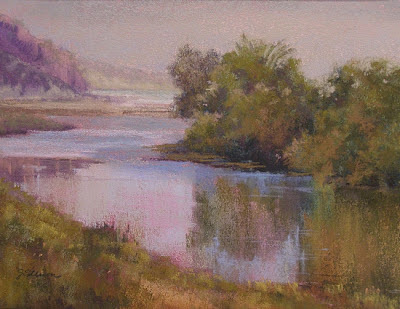 Janis’s landscape paintings in both oil and pastel can now be found in galleries in Oregon and California. Janis is a member of the Pastel Society of West Coast, Northwest Pastel Society, Pastel Society of New Mexico and Sierra Pastel Society. She has achieved Master Pastellist status with the Pastel Society of Oregon. Janis has been published in The Pastel Artists International Magazine and won numerous prestigious awards in regional, national and international shows.